Third grade ate my lunch. I spent my kindergarten through second grade years in a small school in the thriving metropolis of Kermit, TX, population 8,000 or so. My family was blessed enough to move into a bigger house across town (a whole mile or so) which meant I would have to transfer to the other elementary school, Purple Sage, aka Purple Prison. I don't know why the kids called it that because I'm sure it was a lovely school with lovely teachers, but I was convinced. I would begin the third grade in prison away from the friendships I had obviously worked diligently as a 5-7 year old to cultivate, and by cultivate, I mean sharing my crayons and chasing boys on the playground. To be a little braggy, I was a top dog my first three years of school. I know for a fact I was one of Miss Lemon's favorite little first graders. She had an awesome claw foot bathtub full of pillows in her room, and if you got the most papers on the board for a week you could take your rest time in the tub. It was so fantastic. (Sometimes I wonder if she ever washed those pillows. Can anyone say head lice? 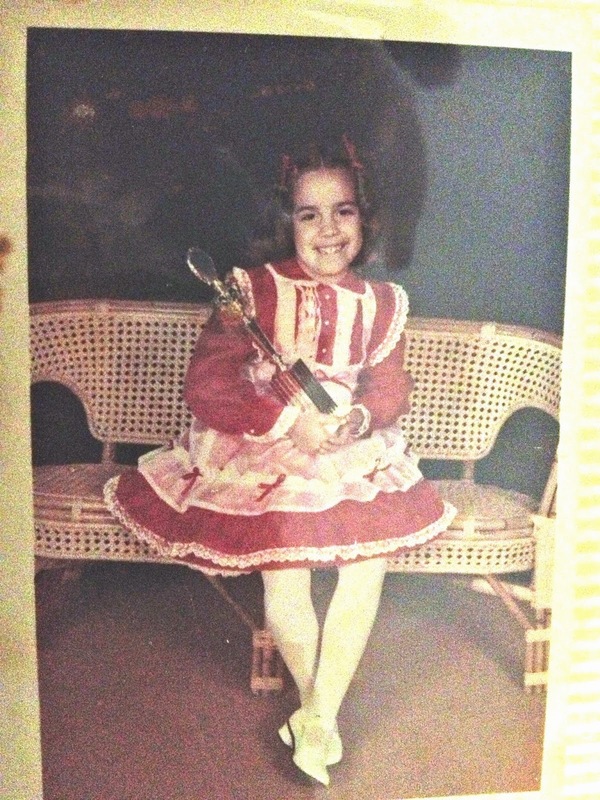 *shudder*) I received so many awards my first grade year that she started coming up with new, exciting ways to treat me, such as drinking a coke out of the bottle while sitting in the school office. Let me tell you a first grader in 1980 felt pretty darn awesome with a reward like that. I didn't, however, receive the title of teacher's pet in second grade. With Mrs. Riley probably no one did. We sat in rows and dared not utter a word. I'm convinced she's started me down the track of my fear/hatred of math. Let's just say she didn't really want to help me understand how parenthesis work in an equation, but that's for another story. However, in Kermit, TX in the 1980s at the end of every school year, teachers passed out these beautiful certificates called K Awards, and Mrs. Riley thought I deserved the best handwriting award plus a couple of other acknowledgments. In first grade, Miss Lemon gave me a stack of K Awards. So, in first and second grade my desire to achieve for recognition was born. Can't you just imagine how funny and cute it must have been seeing me belt out "I AM A PROMISE" at the top of my lungs during the talent competition of the Miss Cinderella Pagent? I think my mom may be the only one on the planet that would defend how amazing I actually was. 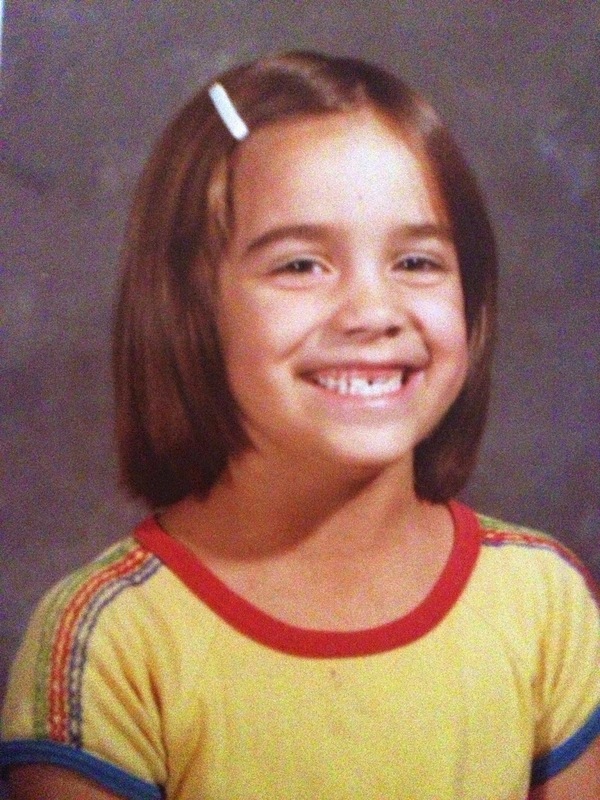 2nd Grade, I think, but maybe 3rd grade based on the awesome pair of grown-up teeth that seem to be making their debut. But, this surely is 3rd Grade, maybe. But that short suit... don't be jealous. Third grade, however, was a whole new playing field. "Thankfully" (kind of) I had a "friend" (kind of) from church in my class. Truth be told, I was pretty much jealous of her because I fully believed she could do everything better than me... roller skate, sing in our kids' choir, memorize bible verses, all the important little kid things. And "thankfully" she sat right in front of me in our row on the first day of third grade. She thought it would be a good idea to turn around and tell me all the things, and therefore, our teacher thought it would be a good idea to write our names on the board as a lesson to the whole class that chatty brats would not be tolerated. And I cried. I had never in all my life been in trouble in school. Purple Prison lived up to its name on the very first day of school. In third grade, I struggled to make friends, didn't win any class competitions, rarely had a paper put on the board, peed my pants in class, and didn't receive a single K Award. I most definitely thought I deserved something. I mean, I had achieved in first and second grade. How could I have been so overlooked in third grade? It was a rough life for a 9 year old. The struggle was real, folks. Do not doubt it. Recently I was blessed with the opportunity to travel to Austin for the IF: Gathering. In the first session, one of the speakers prayed very strongly for God to speak to all of us, "to give us a word." Simultaneously in my heart, I was telling God that if he had something specific I would listen, but that he owed me nothing and I would be content to be in his presence. But do you know what he did for me? Gave to me in very specific, personal ways. He is a good, good Father. Throughout my life I've been a hard worker, sometimes for the sake of hard work and sometimes for the sake of what I could gain, whether an award or a friend or a pants size. But, God showed me during IF that through the years of my life, what seemed to be an independence or an indifference to people's response to me was actually a wall of protection I had built because of life's disappointments. You see, I believe it's all connected. What happened to us as children certainly affects how we interact with the world as adults. God showed me that as a nine year old I began to believe the lie that I was overlooked. One would think that something so seemingly insignificant wouldn't affect me, but one would be wrong. As God was gently revealing this to me, I saw glimpses of how I responded to situations in middle school, high school, college, and even now, of how I played off being "overlooked" like a cool cat. I had let a corner of my heart become hard and stoney. The ironic truth is that I am overlooked by people quite often. As God was working in my heart during one powerful song, he was revealing to me that through all the overlooking, I had begun to believe that he was also overlooking me in order to use other friends, other leaders, and other churches. Through his kindness he was breaking the chains on my life by whispering to me that I belong to him, he knows my name, he uses my gifts, he has me in the place he chose for me. Please know I haven't been walking around for the past 33 years trying my hardest not to be overlooked. The rotten fruit of this lie recently showed up in my life by way of a discontentment in wondering if I was doing enough or even if I was enough. I found myself constantly looking to the left and to the right to see what others were doing, and to see if anyone was looking at me. It was exhausting, and most definitely robbed me of contentment and joy. What he showed me that day in Austin is that he is enough. Now I've known this in my head for years. With my hands lifted high I could honestly and loudly sing all the songs telling him that he was enough for me. But the beauty of rich, God-revealed living is that he not only wants us to know his truths in our heads, he wants us to experience them in our lives. Through the power of his Spirit, he was moving this grace from my head to my heart, so I could live it, believe it, and proclaim it. Such sweet relief. To wrap up the weekend at IF, we each wrote our step of faith (where and what) to show how we would respond to what God spoke to our hearts. I wrote: My place is Tucson, and my step is to believe that I'm not overlooked and to lead my people with as much love as I can give. Honestly, I think I've been loving them strongly for a really long time. But, I also know that I've reserved the stoney part of my heart for self-preservation for when someone leaves, or gives harsh critique, or chooses someone else over me. And guess what! People will leave. I will receive harsh critique. Others will be chosen over me. But as much as I know I would not overlook my children for someone else, I know God doesn't overlook me. And as much as I know my children aren't meant to do everything all the time, I know God does not mean for me to take on responsibility that he hasn't given me. And as much as I want my children to find their niche and be filled with such great joy while maintaining soft, pliable hearts, God wants me to love where I'm serving, love the gifts he's given me to use, and to allow him to mold and make my heart more and more like his. Interestingly enough, when I returned to Tucson, I heard from my women that I love to lead, that they missed me. They, too, wrote on rocks while engaging in the simulcast of IF, and they left their pile of rocks on my desk which was a beautiful display of their love for me. I use the words on their rocks to pray for them by asking God to give them strength, perseverance, and joy as they take their faith steps. Friends, even if the people around us, people we think should see us, people we long to know can't seem to even remember our names, God never ever overlooks his children. He doesn't seek to give us a job or a platform or a best friend or a spouse or the perfect house to prove he remembers us. He has already given Jesus and his Spirit to prove that we've not been overlooked. He is fully available to us. We no longer need to look to the left or to the right to see what others are doing or to see if they are looking at us. We only need to look to straight ahead to the face of God. So, if you made it this far, congratulations! This lengthy thing is more like a chapter of a book than a blog post. Thanks for hanging with me until the end. As a reward (ha, see what I did there?) I'm doing a little give away. To enter all you have to do is leave a comment. Answer one of the following questions and then at the end of the week, I'll draw someone's name. 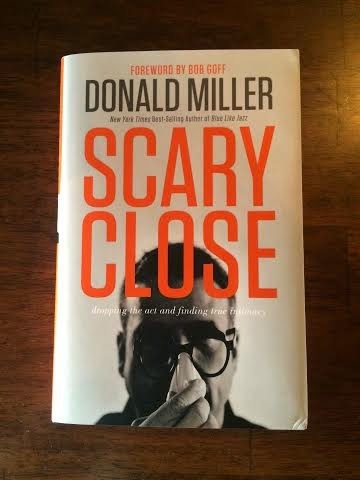 I'm giving away Donald Miller's new book Scary Close. It is so, so good. I read it in a couple of days, and if you know my slow reading abilities that should tell you how good it is! Mr. Miller will challenge you in your ideas of vulnerability and relationships. I thoroughly enjoyed this book and I will read it again. Leave comment to enter because you want this book. I promise. What have you been learning lately? Did anything I shared resonate with you? In what ways do you see you are God's beloved? In what ways have you seen the connectedness of your life? Many blessings in your faith steps! 1. Miss Cinderella Pagent!? How could I have not known about that before? The years of teasing that have been wasted! 3. I resonate with a lot of this. Wanting recognition for my 'achievements' is a theme of my life. And even currently I struggle with wanting to be praised, sought out, acknowledged, SEEN. I have been working with Jesus to let him be enough for me, to lean into him and know and understand that he sees me, he seeks me out always. There are good and bad days in this area, but he is moving this truth deeper into my heart through his word, teachings and life circumstances. I'm so thankful he's so faithful! God had been showing me also that He is enough. Day to day He is asking me to believe that He is better and to trust Him to uphold me in all of the big and small acts of obedience. From continuing to seek community to engaging with women at work, it is all about experiencing more of Him and resting in His sufficiency. I know I already said this but He keeps bringing me back to it: If God is upholding me, then that is enough for me. I just love you Angel Haynes. Thank you for sharing your thoughts and opening your heart so we can glean from what you have to share. To often I fall into the lie of caring what others think and looking around instead of straight ahead. It is such a good reminder and something I need to put into practice that GOD is enough and he always sees me. May I be confident in the gifts God has given me and ready to share them. Thank you my friend for being you. Love and miss you!!! I really connected with what you said in this post. Especially when you shared that God doesn't seek to give us a big house, or a perfect job to show that he remembers us. He has already given us Jesus and the Holy Spirit to prove we are not overlooked. Thanks Angel for being vulnerable and sharing. Ugh, wrote a comment and managed to erase it. So I'll get right to it! I've been learning that even though I have certain talents and the ability to work hard and do a good job, I can't will good things into place in my life. I'm not God, I'm not in control, and often the things I think are good for me really aren't. I'm rereading "practically theology for women " so a lot of what I've been learning has been right in line with the Hebrews study. It's been a good reminder of the reality that we live out what we believe. Thank you so much for sharing this, Angel. I always appreciate your willingness to be vulnerable and real with us women. Can I also say, I definitely see a little of Morgan in that second picture down. So cute! God has been teaching me how he is enough in the realm of finances and that he sustains me as I strive to lead out in my community. I am not enough nor do I have enough strength work on my own, but HE is and I'm learning how much freedom there is in leaning on him. "We no longer need to look to the left or to the right to see what others are doing or to see if they are looking at us." This is something I tell myself over and over again, but still don't seem to believe it! Brings me back to the verse God gave me last year Galatians 1:10. I think the biggest thing God is teaching me right now is that He is everything I need. I feel like in the last year I have had a lot of my identity taken away from me. I know God is preparing me for more and the best life he has for me, but it doesn't make the loss of identity any easier to take. So for now I am trying to focus more on what God has given me and less on what I feel He has taken away. Learning who I am in Christ and focusing on this identity instead of creating a worldly identity. And I love seeing my rock there and reminded what God has challenged me to do! Thanks for a beautiful post, Angel. The concept of "earning" acceptance from other people is familiar to me. Go figure. :) I am so familiar with looking for my stacks of "K awards" and peeking at the stacks of others, even just to see if I matter. If I match up. Do I meet your expectations? God has been so gracious to show my much freedom from living under the tyranny of that, but I also constantly re-learn that lesson. I think something God has been teaching me a lot about lately is my own childhood and past, actually. I realized recently that I think some of the more difficult things from my childhood created in me characteristics that actually match a mild form of a particular personality disorder. I don't show too many symptoms anymore, but I see my 19-21-year-old self staring me in the face. Patterns of avoidance, impulsiveness, insecurity, mercurial angst, inability to form stable relationships for a gnawing fear of abandonment...ugly stuff. But making that connection, apart from being sad, was also freeing. God is drawing me out of my own caves of fear and into open fields of grace. I also see the gracious beauty of what He already HAS done to change what was once overwhelming. Seeing these patterns as an actual trauma-induced disorder helped me to realize that they weren't ingrained pieces of my design, but coping mechanisms from which I could heal. Not life sentences, but bricks in just a part of my journey's road. Deep things. God hasn't forgotten. He hasn't left. He hasn't rigged me up to fail in the thousand ways I sometimes expect to. No...our God is for us. He is Emmanuel, God with us. As Hagar so poignantly realized, He is the God who sees. He has seen my past, and knows my present. He knows the plans He has for me. :) God is for us, not against us. And His praise will ever be on my lips. Beautiful post. Thank you for sharing your heart! And I agree with Erin, I TOTALLY, see Morgan in some of the pictures! I love Ecclesiastes 5:19 "Everyone also to whom God has given wealth and possessions, and power to enjoy them, and to accept his lot and rejoice in his toil, this is the gift of God." Sometimes the day to day feels rather insignificant and I feel like there often is little to show for the work I do at home. It is so wonderfully freeing to know that I have a God that loves me and doesn't require me to do "big" things by the world's standards but judges my heart and my willingness to obey. I'm continuing to work in finding my confidence in his love and grace and not my own actions. Thank you for your vulnerability in this post, Angel. I really appreciate how you connected things in your past with where you are today, and your willingness to let God redeem it. I've been diving into my past lately, and it has been good to see some of my blind spots come forward. One of the most prevalent ones is accepting that I need to take better care of myself by creating nourishing friendships, prioritizing time with Him, and resting. I think in my own mix of pride and lies, I've come to believe that I don't need/deserve/get the self-care (soul care? haha) that others do. Yet I'll find myself feeling ugly-jealous of people who allow themselves to slow down and to let others take care of them. Re-learning that God has set me free for freedom's sake, not to be used by Him, has been life-giving. It has allowed my desire for obedience to be motivated by love instead of duty, and has begun to instill much more joy and hope in my obedience. Also, LOVE love love you and your awesome family, and will be praying for you all this week. I loved this post just like all the ladies before me. I can completely relate to looking to the right and the left for a fear of being over looked. My insecurity in this area comes in serving. I fear if I don't serve in every area then people won't notice my service or if I don't fill every need I see or hear about then people won't believe me when I say I have the gift of service. This is super disgusting and gross. I feel like last week Chad's message hit me in the gut. God very clearly told me through Chad that it doesn't matter if other people notice. What matters is I act out of obedience for the Lord and know that my reward is in heaven and my reward it eternity with Jesus. I am also learning that if I try to fill all the needs others don't have an opportunity to use their gifts. If I am so focused on filling every need instead of being in tune to the needs God would have me fill I am missing opportunities God has laid before me. Thank you for loving me and the women of Second Mile so well!! Thank you for keeping your heart open throughout the difficulty of life, relationships and ministry. Your open heart is such an encouragement to me. I resonate with hard work playing a role in my identity and I have relied on that in the past instead of relying fully on my identity in Jesus. There are still areas of my heart the Holy Spirit is working on in that regard. The Holy Spirit has given me many moments over the last couple years of reflection on the beautiful work on my life He has done. I feel so humbled and loved by God, remembering where I was and where he has taken me and who He has made me become. I am a new and beautiful creation in Him. My offering to Him is a life that shows what He's done in me. Thank you, Angel for your influence on my life! Love you and praying for you! Always love hearing from you. I love how your able to communicate clearly and effectively, while making it spiritually challenging. You're truly an asset to tucson and Gods kingdom. Great post Angel! Thanks for sharing what God has been speaking to you! This definitely resonated with me. As a pastor's wife with little ones I often feel pulled in all different directions and end up feeling that I'm not enough in any arena or that I should always be doing more. I needed the reminder that God hasn't made me or called me to be all things, but to thrive right where He has placed me in this season. Thank you for sharing Angel, I truly respect your vulnerability. I love even more how much it inspires all the woman to be vulnerable and share as well. Reading along, comments and all, reminded me of what the great community I belong to, full of women willing to go the second mile no matter what it takes in order to have a deeper, more real relationship with God. I too can relate to so much that was said, I too look at people ugly-jealous when they allow themselves to rest and nurture themselves. It has always been a struggle for me to not measure my worthiness in what i do for people or in what i have to offer. Just when i thought i had learned as much as i could, POW i have another baby :) All i can do and want to do is be a mom and wife the best I can. God really had to close me in without a way out. I have no choice but to stand still and say: I have nothing to offer you friends, nothing that I think would make me valuable to you, Do you still love me?.... At the end of the day, God has to be enough for me! I resonate with so much in this post. Thank you for your wisdom! I often wonder if I am doing enough and look to the right and left and compare. Its so exhausting to live in those lies. But God is so gracious when I am faithful in turning to His truth. I especially loved the call from IF:gathering last year to "run your race". And I am grateful that I get to run this race alongside you!